In another post I wrote about how to cook flæskesteg (Danish pork roast). If you have some leftover flæskesteg, you can make this dish very quickly and easily. You can also substitute tofu or shrimp in place of the pork. Add boiling water into a bowl. Pour the sugar into the hot water, and stir until the sugar is dissolved. Slowly add the fish sauce, a little at a time, until the mixture tastes sweet and salty. You will see the color change to a deep dark orange. This part is optional (if you can’t handle the heat): add 1 teaspoon of chili sauce, 1 teaspoon of Sriracha spicy sauce, and ½ clove of minced garlic. Cover the rice vermicelli with water in a pot, add a spoon of white vinegar, and cook until tender. Use chopsticks or forks to help separate the noodles while boiling. Drain the water. Cut the romaine salad roughly. Cut the cucumber into small strips, and roughly cut the mint and cilantro. Heat the flæskesteg in the microwave or oven and cut it into rectangular slices. 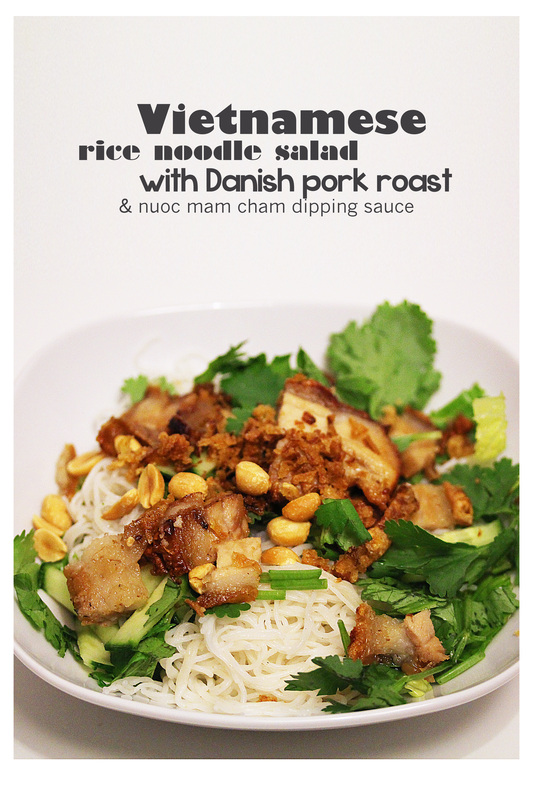 Place the romaine lettuce into the bottom of serving bowl, cover with rice vermicelli, and top with flæskesteg. Garnish with mint, cilantro, chopped peanuts and fried onions, as you desire. Serve the nuoc mam cham on the side, but add plenty of the sauce on your dish before you start to eat.